The Handy Dri range consists of three models offering a choice of push-button or 'no-touch' operation and provides a comfortable balance between temperature and air flow for safe and effective drying. 1.8kW (Handy Dri 18) push-button operated units. Alternative 1.4kW 'no-touch' unit (Handy Dri 14E). Automatic switch-off after 30 seconds. 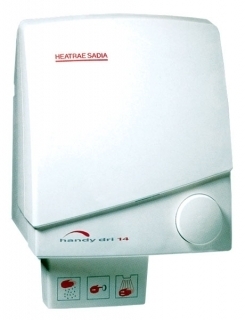 Handy Dri 14E has automatic switch-off via sensor. High efficiency fan and air flow system.